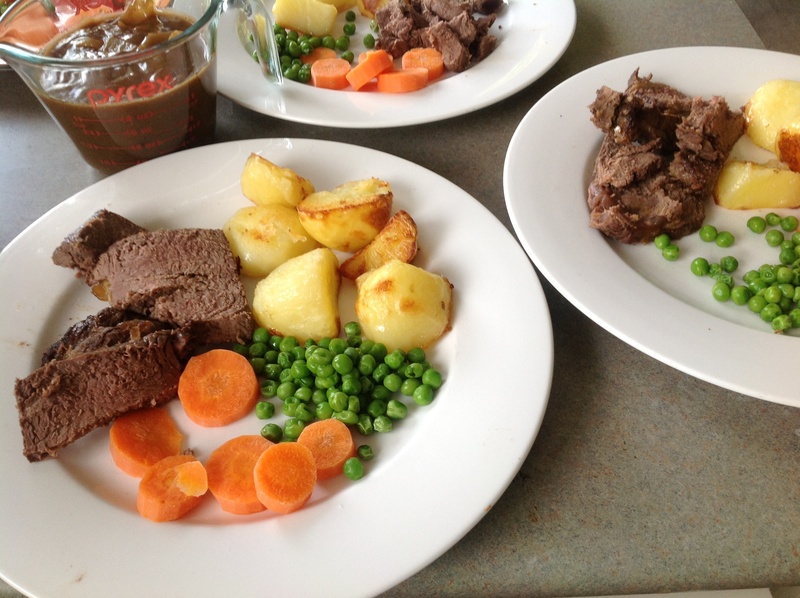 Day #5 – Roast Beef | Have kids, they said. It'll be fun, they said. Roast beef tonight. Not because I particularly feel like roast beef mind, but simply because I thawed it so must use it. It is actually quite a muggy day today and the oven blasting at ridiculous temperatures just adds to the heat. But, here we are anyway. Because I am cooking a rump roast (don’t ask me about different cuts of meat vs their merits, I know about as much about beef as I do about fish. Which is, very little. But, I’m learning! ), I decided to do it by searing and then cooking at a low temp. I would love to say that I’m cooking it with all the trimmings (kumara, parsnip (gross), carrots, onions, peas, yorkshire pudding) but I’m not. I don’t have most of those things in my house, so we are having Roast Beef with potatoes and peas. And maybe carrots. Since typing ‘yorkshire pudding’, I’m reconsidering cooking it, because I LURVE it. But, no, not tonight. Definitely putting that on the list for another night though! 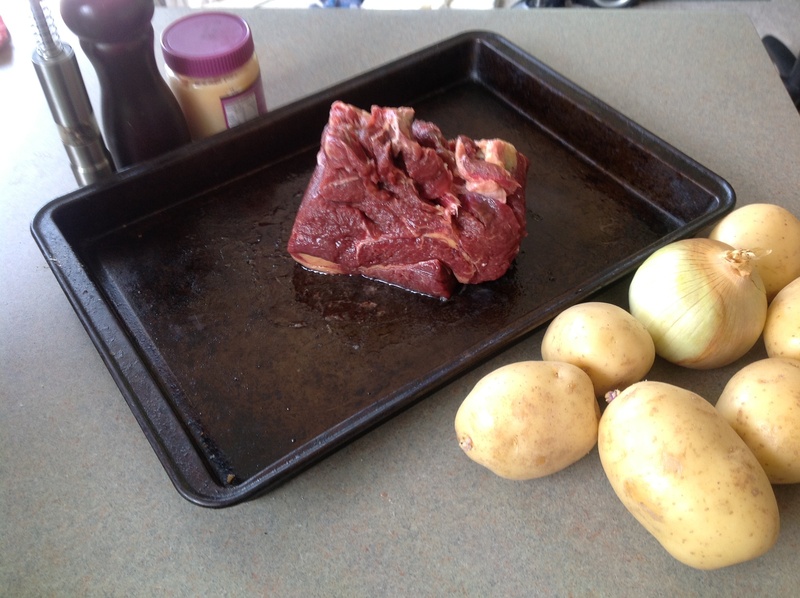 Leave the beef out in room temperature for about half an hour before cooking. Why? Because that’s what they recommend on MasterChef. True story. Make 4-5 slits in the rump (it’s ok, I giggled too) and shove in some garlic and salt and pepper. Put more salt and pepper over the entire piece of meat. Sear in the oven for 20 minutes at 235C. Bring out and add the chopped onion and water to the dish. Put back into the oven and cook at 135C until cooked to your liking. I like my meat medium-well done, Mr T likes his a bit bloodier. Rest your meat when it is done, for about ten minutes before cutting. This one I know why – it is about the juices going back into the meat and making it more tender and moist. Or something (told you I knew). For the potatoes – I am trying to master the perfect roast potato without smothering them in fat. I’m about 80% there, I think. I peel and boil them until they are just tender, then drain the water and give them a good ruffle-up. A shake up. Roughen up their edges, if you will. And then I roast them with some oil until they are crunchy and delicious. Om nom nom. I could eat roast potatoes and gravy until the cows come home, I tell ya. Gravy. GRAAAAAAAVVVVYYYYYY. Because the meat was cooked in water and onion, making the Most Amazing Gravy was super easy – just add flour to the tray once the meat is removed and whisk it over a low heat. This gravy was Homer-Simpson-drool-worthy. Amazing. One of, if not The Best, roasts I have ever cooked. The garlic added a nice mild flavour, it was cooked to perfection and of course, the gravy. Did I mention the gravy? There were even leftovers. I’m already excited for tomorrow when I get to eat the meat gravy again. Looks tasty. My favorite food group has always been gravy.